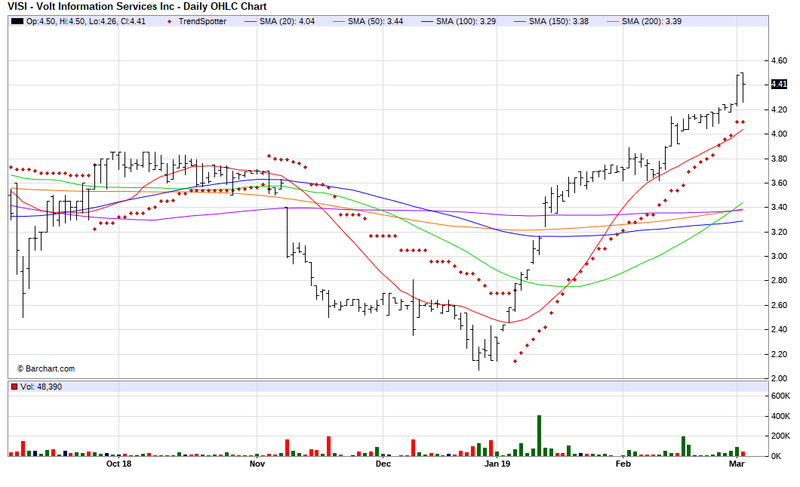 The Barchart Chart of the Day belongs to the business services company Volt Information Sciences (VISI). I found the stock by using Barchart to screen for stock having a Weighted Alpha 50+ and technical buy signals of 80% or more. I then used sorted that list of 119 stocks by the most frequent number of new highs in the last month then used the Flipchart feature to review the charts for consistent price appreciation. Since the Trend Spotter signaled a buy on 1/8 the stock gained 54.74%. Volt Information Sciences, Inc. is a leading national provider of Staffing Services and Telecommunications and Information Solutions with a Fortune hundred customer base. Operating through a network of over three hundred Volt Services Group branch offices, the Staffing Services segment fulfills IT and other technical, commercial and industrial placement requirements of its customers, on both a temporary and permanent basis. The Telecommunications and Information Solutions businesses, which include the Telecommunications Services, Computer Systems and Telephone Directory segments, provide complete telephone directory production and directory publishing; a full spectrum of telecommunications construction, installation and engineering services; and advanced information and operator services systems for telephone companies. Although Wall Street analysts have not made any projections the is 1 Strong Buy recommendation.